Dubai, UAE, February 26, 2018: Everyone likes attractive looking nails and there is no doubt the market is packed full of choices for nail polishes – but how many of these will look flattering with out causing damage to your nails or the environment? If you prefer your nail polish to be non-toxic, halal and cruelty free – FC Beauty launched its nail polish range in the UAE, with an innovative formula free from harmful chemicals, Islamic Sharia compliant and has not been tested on animals. FC Beauty developed a highly pigmented formula similar to the gel effect - meaning that one coat is all you need for an opaque and long lasting polish that can last for up to two weeks without chipping. Also, the brand noticed the demand for matte and shimmery nail polish in the market, as it’s the new trend in spring/summer 2018. Thus, the brand has come up with an innovative formula that combines both finishes – it looks matte but contains particles of shimmer, giving a unique and luxurious look to your nails. Golden Milkshake: these are highly pigmented, have dazzling diamond like particles in them and there are 27 shades in this range. Crystal Sand: these have crystal particles in them with a matte finish and there are 24 shades in this range. All the nail polishes by FC Beauty are free from chemicals like Toluene, Formaldehyde, Paraben, DBP and Camphor – which might harm and weaken the nails in the long run. Also, the nail polishes are compliant to the Islamic Sharia – meaning they do not contain Alcohol, Ethanol, Ethyl Alcohol or pork derivatives. Not to mention that FC Beauty is totally against animal testing - so their nail polishes are vegan and cruelty free. 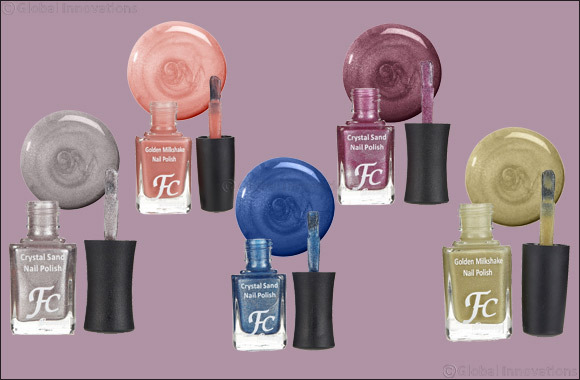 FC Beauty nail polishs are all priced at AED 24.